Buying and Setting Up Your Own Business: How to Start Running a Dog Grooming Business from Home Have you ever dreamed of owning your own business? Having an entrepreneurial flair is one thing, but how do you channel that energy into different projects, and how do you make sure they succeed? With that in mind, it’s clear that starting a business is a multi-layered process. The first step is a simple one: ask yourself where your passions lie. What makes you want to jump out of bed in the morning? Do you have a love for animals and a passion for helping others? Then you could combine both of these into one incredible opportunity and set up a dog grooming business from home. Aussie Pooch Mobile Dog Wash began when we took those same passions you feel today and transformed them into a way to help others. A clean dog is a happy dog, and we're proud of the fact that so many pet owners welcome us into their lives as we offer a robust mobile grooming service in the comfort of their home. Even if you have no prior experience, there's nothing to worry about: Aussie Pooch Mobile provides you with all the training necessary as we teach you how to start a dog grooming business. If you are thinking about buying a dog grooming business, you should consider your current lifestyle and interests. Do you enjoy being outdoors? Do you prefer to travel for work rather than work from home? Then a mobile dog grooming business might be for you. Setting up a dog grooming business from home will give you the freedom to travel for work, spend time outdoors, and work with cute, friendly animals. Aussie Pooch Mobile Dog Wash offers dog lovers the opportunity to start your own mobile dog grooming business. Mobile dog grooming is the perfect solution if you want to own a dog grooming business but still want to keep your home and work life separate. A mobile business gives you the flexibility to choose your operating hours and the freedom to take holidays. Aussie Pooch Mobile grants regional exclusivity to our franchisees, giving you an incredible opportunity to grow your business in an environment where you have all the room necessary to make a splash. 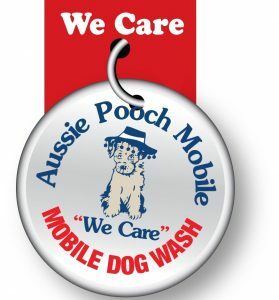 When you sign up to be a franchisee, you’ll receive your own Aussie Pooch Mobile dog washing unit as well as a starter kit of dog grooming products, so you can be on the road and grooming dogs in no time. Aussie Pooch Mobile Dog Wash makes owning a dog grooming business easy. If it sounds like you fit the profile of someone who would love to find success caring for happy dogs each day, we know you’d be a good fit within our business family. We encourage you to read some testimonials from other people who successfully run a dog grooming business from home. Check out our frequently asked questions as well to find out more. Remember, there are franchise packages available to suit many different levels of investment — we welcome the opportunity to have a chat with you about each of them. If you’d like to learn more now about buying a dog grooming business of your own, please visit our franchise enquiry form today.